Scientists at the University of Dundee have identified a `molecular commando’ which can be stealthily deployed to activate a hypoxic response, a process which can help to fight a range of conditions including stroke, angina, colitis and brain injuries. 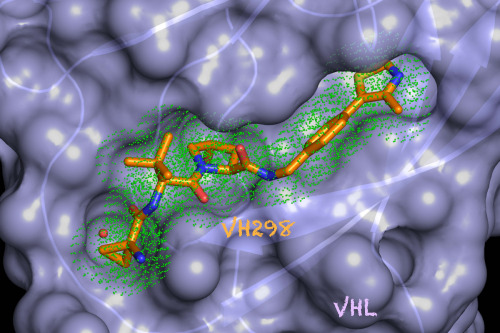 A Dundee team led by Professor Alessio Ciulliin the School of Life Sciences have used pioneering techniques to develop a `small molecule’ chemical probe called VH298, which offers highly targeted access to the parts of the cell which regulate hypoxia, known as the hypoxic signalling pathway. “Using a small molecule like this offers a highly targeted option to control the hypoxic pathway, and one which can sneak in under the cell’s natural defences to perform its work, a bit like a molecular commando,” said Professor Ciulli. Active hypoxic signalling can be both good and bad, depending on context. In diseases like cancer it can be a bad thing as it can help tumour cells to survive and prosper. However, a hypoxic response can provide therapeutic benefits in conditions such as ischaemic injuries to the brain or heart, including stroke, and anaemia due to chronic kidney disease or chemotherapy. “This is important as a chemical probe because it means we can make better measurements of cause and effect and build more information about how hypoxia works and how we may be able to control it. It also offers a potentially drug target in itself. “We have been able to develop this project due to the world-class expertise we have at Dundee, bringing together people from different laboratories and areas of knowledge,” said Professor Ciulli. “So in my lab we work on design and studying how this types of molecules work but we are also able to call on scientists like Sonia Rocha, with expertise in oxygen sensing pathways, Doreen Cantrell, whose world-renowned work includes the role of hypoxia in immune cells, and Kevin Read in our Drug Discovery Unit, who has helped us maximise the drug-like properties of the molecule.